I gave my heart to the Lord when I was a child. I don’t know any other way of life and I don’t want to. In my darkest hours when I’ve felt most unloved and unlovely, I knew that my Heavenly Father loved me. I am no stranger to the Lord God Almighty, Creator of the Universe. He knew me before I was born. He has known me each day of my life. He knows me now. He will know me for the rest of my life. When I return to Him after I leave this mortal body, He will know me for eternity. We try to measure things in terms that we know based on life experiences. We can not comprehend anything that has no beginning nor end. Everything we know starts from some point and is anticipated to end at some point. God’s love goes beyond anything we know or can perceive in our little finite minds. God was and is and ever will be… forever and forever. 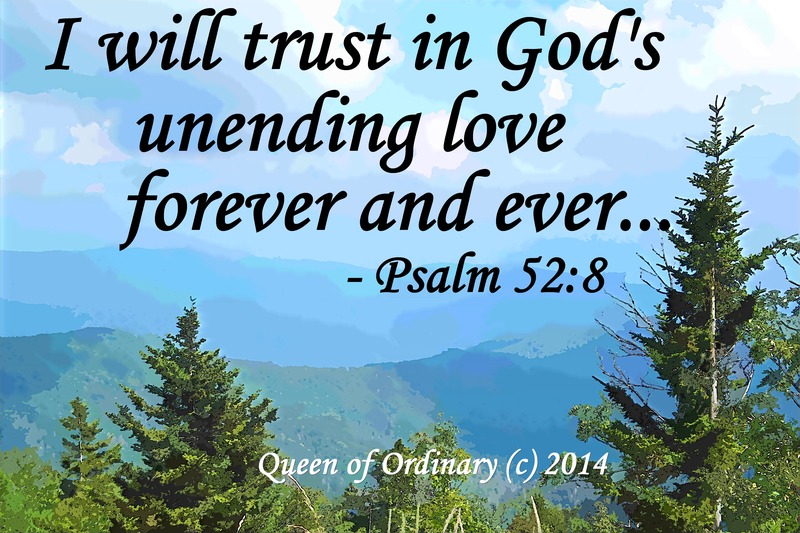 From everlasting to everlasting… forever and forever, God loves His children. Our ability to comprehend is so limited in the moment. We cannot see the big picture of our lives as God sees it. He can see the whole thing unfolded from beginning to end. He can see the choices we’ll make and the ways we will fall short of His highest and best in our lives. Yet, no matter how far an individual has strayed, messed up, or fallen completely off the path, God extends hope – that His plan is “to prosper us and not to harm us, to give us a future and a hope.” No matter where a person has been or what they’ve done, all they have to do is repent, turn their life over to the hands of a loving Father, and His plan for them to proper, to have a future and a hope is renewed. For those who may think no one cares, that there is no point to this life, or question your purpose for even being alive on this planet – I offer this hope. God knew you in your mother’s womb. He had a plan for your life to be meaningful even then. You were no accident in God’s eyes. You were part of His design in this time and this season. He had a purpose for you, and if you will let him fulfill it in you, He still does! Have you ever visited a cave and had them turn off all the lights? Talk about darkness! You can’t see your hand in front of your face! 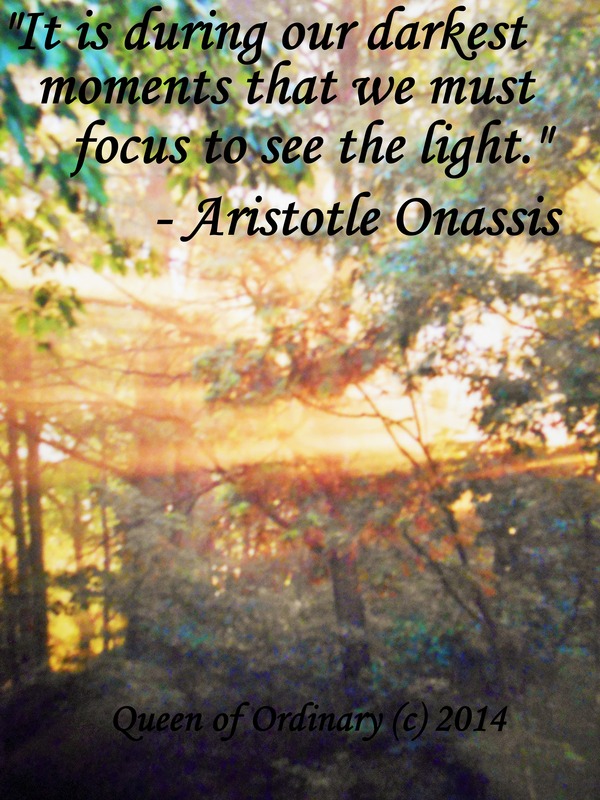 I found that out one year when I took a group of students to visit Mammoth Cave. I was the teacher and supposed to be setting a brave example. I was terrified that one of the students would panic and step backwards or trip over someone and take a bad fall. On the other hand, I was glued to my spot. I was afraid to budge. Both fear and darkness can do that to us. Yet, when they lit a single match in the darkness, it shone brighter than any match I’d ever seen. One little match had the power to dispel the darkness, but there were still dark places all around us where the light was blocked. Until the electric lights were turned back on, we all focused on the light. – Ye are the light of the world. A city that is set on an hill cannot be hid. – And the light shineth in darkness; and the darkness comprehended it not. John 1:5 -This then is the message which we have heard of him, and declare unto you, that God is light, and in him is no darkness at all. I live in Appalachia where people have strong faith in God, strong loyalties to their families, a love of the earth, and a will to survive. Sometimes I think the people living at the head of the hollow or on a little farm in middle America or in a cabin in the New England woods are the lucky ones. Those who have learned to be content with their lives, cherish their relationships, and creatively make the best of their circumstances seem to be happier in their own ways. I like the encouragement to look at what is at hand and make the most of it instead of focusing on things of which we do not have. The Bible promises that God will supply all of our needs according to His riches in glory. If He doesn’t provide it, there is another way to take advantage of what we have at hand that we simply have not discovered yet. I am always blessed by this blog. If you haven’t checked it out, please do. … Church wastes a Sunday. … prayer is merely meditation. … the Bible is a best-selling self-help book. … charity is a utopian ideal. … faith is a crutch. … self-denial is a waste of effort. … everlasting joy is a myth. … God does not love us. … suffering is without meaning. … this is as good as it gets. …our future is a grave. 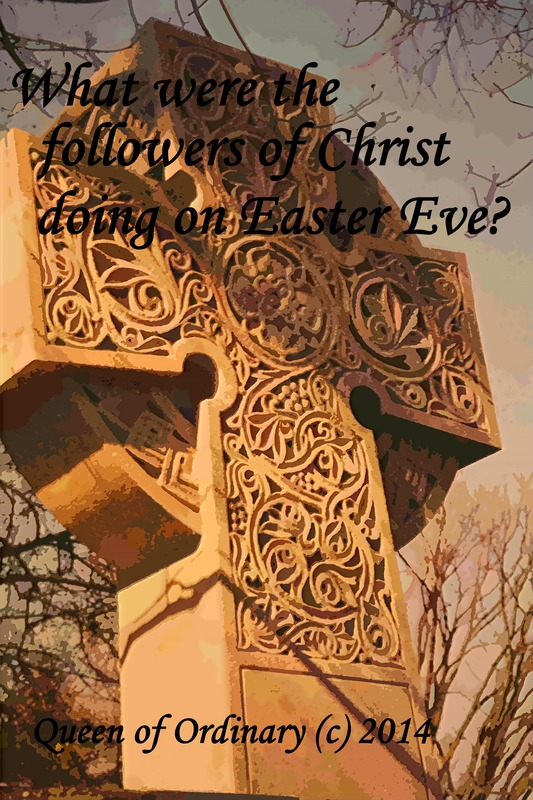 Walk with me on an imaginary journey to the tomb of Jesus on Easter Eve. His disciples, followers, families, and friends were devastated. The kindest, truest, miracle working man anyone had ever known had been falsely accused and crucified. His wounded body had been laid in the tomb along with all of their dreams of who He would become on this Earth. Things had not turned out the way they anticipated. How could the Son of God be killed at the hands of man? If the soldiers had come for Jesus, would they be coming for them as well? Would they be falsely accused? Crucified? Where were they to go? What were they to do? Where was God in all of this. Why hadn’t HE stopped the brutality to Jesus? They had to be feeling hurt, alone, confused, and abandoned. Their dreams were in disarray. Their understanding was incomplete. Gossip and fear were wild and people wanted answers Christ’s followers couldn’t give. Have you ever felt that way in your own life? 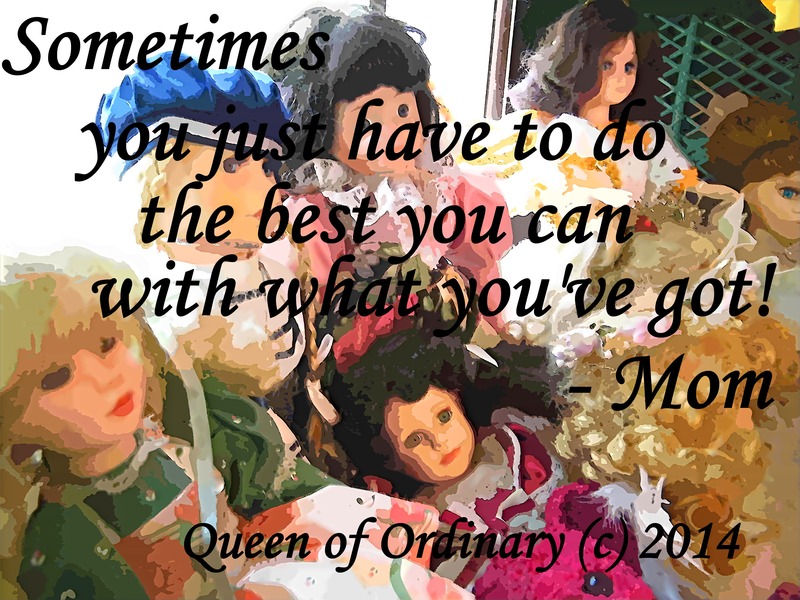 Have things turned out so differently from what you had hoped that you just feel utterly undone? Most of us feel that way at one time or the other in this life. If they could only have known what a difference 24 hours would make! 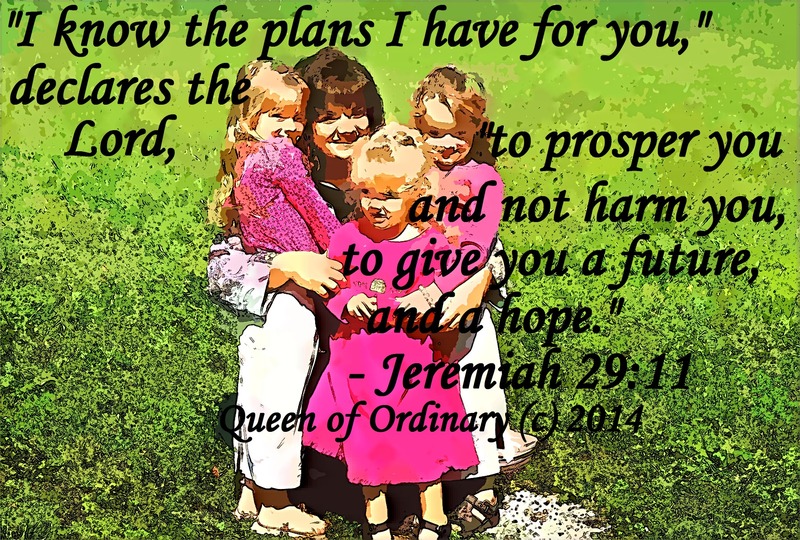 God’s plan and purpose are always better than we can imagine. HIS timing is perfect. When we are stopped dead in our tracks and can’t see which way to turn, God sees what lies ahead. If Jesus had stayed in the grave, none of their lives would have made sense. Can you imagine the joy and relief they felt when they saw/heard about the empty tomb and actually saw the resurrected JESUS! He walked among them, sat with them, let them see Him as eyewitnesses and KNOW that he had overcome the grave. Then and now and forever – HE IS ALIVE! And WE have no idea how near our answers are. We have no idea how close we are to the breakthrough, the purpose, the understanding we’ve been trusting God to bring to our lives. Sometimes 24 hours makes all the difference! I have only reblogged one other post this one is awesome. Thanks Stacey! Where God Was Alone and Afraid. Sometimes when I have the best of intentions is when I do the dumbest things. I went to help my mother today about half an hour away from home. She is 80, my dad 82, and they still pastor a small country church. She was worried about there being enough eggs to hide on Sunday for the annual Easter egg hunt so that all the children would go away happy. I went to help her dye 7 dozen eggs, and we filled another 4 dozen or more plastic eggs with candy and money prizes. Then we went and made sure the tables in the fellowship hall had fresh table cloths, and everything was in order. That may not sound like a lot, but try it and it will soon become apparent that I needed to be there helping my mom. On the way home I stopped to take a photograph of a redbud tree. They are blooming profusely in our region right now. It wasn’t even a very good shot. I started to back out of the side road where I had spotted the tree and hit a cemetery maker on a pole that I didn’t see because I was still staring at the redbud tree through my camera and thinking everything behind me was empty. My back left bumper is caved in. I was so sick to my stomach! How stupid of me to be backing up and not giving my full attention to that task alone! This sorry photograph will probably cost me $500 when I get the bumper fixed. That would be regrettable at any time, but while I’m trying to hard to save money for my dream trip to Scotland in the fall, it is disastrous. Maybe I can find someone to fix it cheaper than I think. 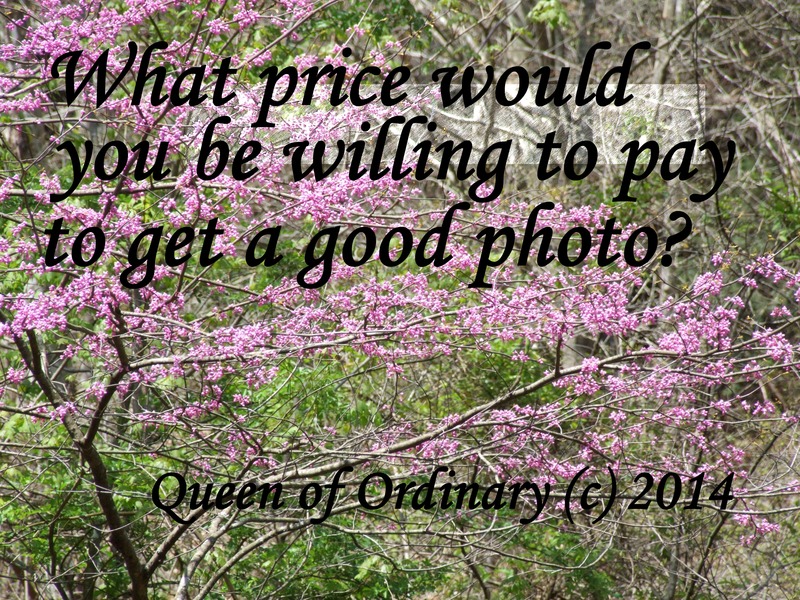 One thing for sure is that the photo of the redbud tree surely isn’t worth what it’s going to cost me! Have you ever heard the legend about the dogwood trees? There are several versions to consider. It was said that lumber men harvested trees to make crosses for those to be executed by crucifixion. It was a business – an income for them. When Jesus was to be crucified, the order came to choose one of the biggest, strongest trees in the woods. They did this and formed the cross that was to be used in the crucifixion of Jesus. After his death, when they went back to the woods to harvest timber for other crosses, all of the mighty trees of the type used for the cross of Christ were withered and dying. In the forest had sprung up little trees, twisted and small – far too little to ever be used for building crosses in the future. Their wood could never be used again in such a way. And in the springtime, these trees produced a flower in the shape of the cross with a crown of thorns in the middle to remind all who would see them of the death of Christ upon a cross and His resurrection. I have always loved dogwoods. They were in bloom in the springtime when my family would make the long journey south for spring break and our Easter holiday week. One year my grandfather (who had 14 children and dozens of grandchildren) sent a letter to me with a single dogwood blossom enclosed. He was not a man of letters. Someone else had been enlisted to follow his instructions, get the address and put the flower in the mail to me. We were not going to be there that year for Easter. I never heard of him sending another grandchild anything through the mail, or even a child. That dogwood blossom was precious to me. I had it encased in plastic and carried it in my bible for years until it was lost. Still I remember how he would let me walk with him into the pastures and the meadows of his mountain farm and point out to me all the little plants coming back to life in the spring. He told me his story of the dogwood and I have never forgotten. 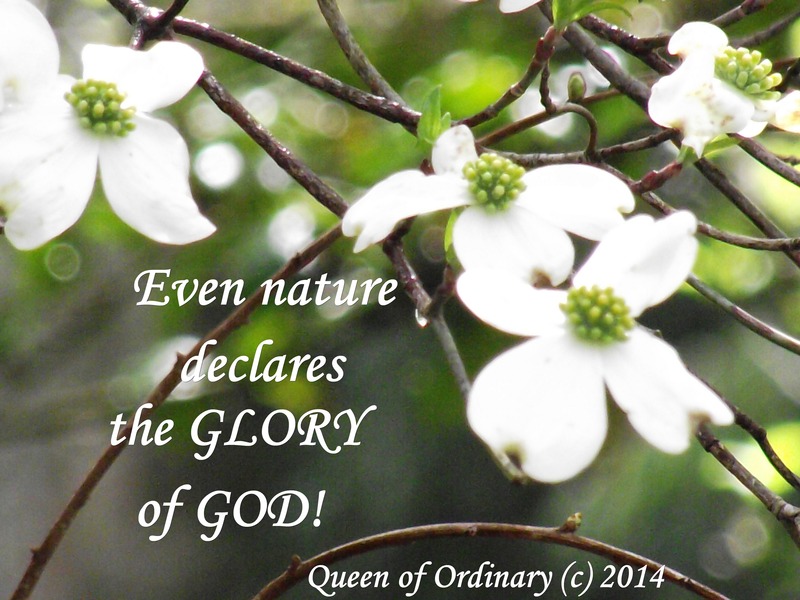 Every spring I think of him and the legend of the dogwood when new life begins to appear on the mountain slopes. I welcome the white petals of the wild dogwoods that grow abundantly in this region. I spent about two hours yesterday literally shredding the past. Some old letters and cards that I had sent to someone in the past came back into my possession. I have nothing bad to say about this fellow. He’s still a decent human being, still morally and ethically a good guy. I was the goofy one. Rereading the cards I’d sent and the letters I’d written, I was aghast at how I poured my thoughts and my heart out on paper. Some of these items were almost 30 years old! Still, they made me feel foolish. I had just come out of an unexpected and traumatic divorce. I was so wounded, so confused, and wanted so much to be understood, validated, and loved as a human being. I needed something from this young man that he couldn’t give me. No one could except God and me. I am thankful that he wasn’t a man who saw how damaged I was by the betrayal of a husband I adored and that he didn’t try to take advantage of my vulnerability. God bless him for that! My letters were sincere and a pouring out of myself on paper. And always, always included my prayers and concern for him as a human being. The cards were totally opposite – silly, flirty, goofy stuff that was totally the opposite of what I was trying to work through. Shredding those things felt pretty good. THANK GOD I am no longer that wounded little girl pleading for acceptance, healing, and validation from any person. THANK GOD for unanswered prayers. In all these years since, I have continued to go back and look at the past, trying to put all the puzzle pieces together and make sense of things that will never make sense. THANK GOD for a reality check. 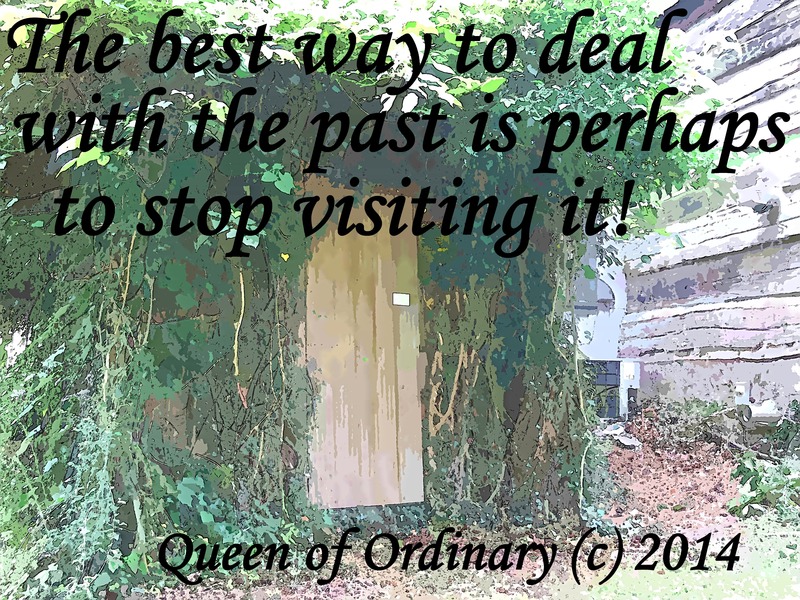 The best way to be done with the past is to stop going back and revisiting it! Forgive it, let it go, shake the dust off and move on.